Another day, another mason jar recipe. I was browsing through some great blogs and I came across this recipe. I had a fridge full of lemons and arugula so I figured it was meant to be for me to make it. And I’m so happy I did. It is all sorts of delicious. It’s one of those recipes that I can make at any time due to the fact I always have every single ingredient in my house. I’ve looked at Italian recipes for Pesto di Rucola and none of them call for anchovies but I think it’s a really perfect addition to the recipe. It gives some saltiness and of course the famous depth of flavour that is always associated with adding anchovies to any dish. Put anchovies on my pizza and I’ll be running away in horror but saute them in a pasta sauce or puree them in pesto and I love it. My husband and I ate it on crusty white ciabatta with goat cheese for lunch. Then on pasta for dinner. Then in a salad dressing the next day. You just don’t get bored of this stuff. Get recipe here. Beautiful. I love that stuff. And now I want some cibatta and goat cheese. Het is heeeeel lekker. Echt om elke dag te eten. 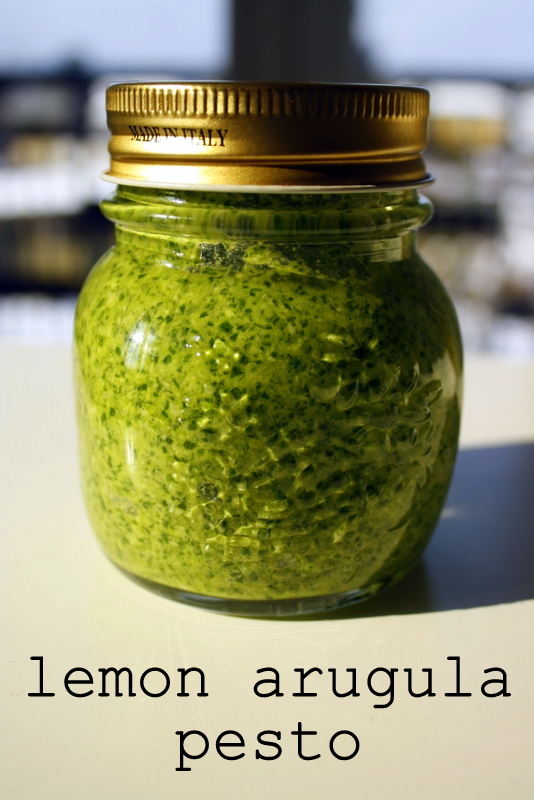 This pesto looks amazing, you’ve inspired me to make it along with your lemon curd and blood orange marmalade before the spring.